In the last episode we have left off at a run in between Dae-gu and Pan-seok at the medical examiner’s office. Pan-seok insists that Dae-gu is Ji-yong, but Dae-gu continuously denies it. 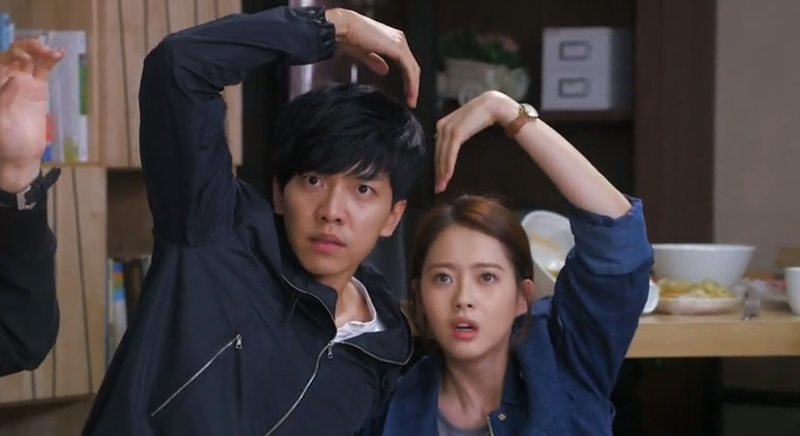 At that time, Gook comes out of another room and Dae-gu quickly pretends that they came together for a case report. However, when medical examiner confirms that Dae-gu did not come by for a report, Pan-seok becomes a little bit more suspicious, and shall we say hopeful? Meanwhile, Gook is becoming more and more apparent in his hidden affections for Soo-sun. He calls her first thing in the morning to inquire where she slept the night before. He selects video chat by accident and sees the room Soo-sun is in. Soo-sun lies and says its her friend’s house, but I wonder if Gook will recognize it later in the story line. Remember we found out that Chief Kang is the mysterious person Dae-gu has been calling lately? Well, we get a flashback of their connection. Apparently while Dae-gu was in the orphanage Chief Kang was his benefactor. She sponsored his education, and met him in person when he entered college. Dae-gu is obviously grateful for her help, and it seems like she knows everything about his mother’s case. Chief Kang asks Dae-gu not to take revenge into his own hands when he finds the culprit, and he hesitantly promises. I’m still unsure where I stand with Chief Kang. Is she the evil mastermind or is she really trying to uncover the truth? The team gathers to look at the autopsy report for the murder case they were assigned in the last episode. Pan-seok explains that the real cause of death in a long winded, but touching story about the dynamic of the father son trio. Gook becomes really affected by this and calls his mom to chat. Tae il also contemplates calling his mom, but ends up not going through with it. I wonder what his story is; I hope he is not just another rebel rich boy. Dae-gu has a depressing moment on the staircase. He types out a text message clearly meant for his mom. He asks if she is doing well, if she has met dad, and if he treats her well. He then erases the message because there is no where to send it to. Pan-seok needs clarification on whether Dae-gu is Ji-yong or not. He goes with Gook to the shared apartment and takes Dae-gu’s toothbrush. After Pan-seok leaves, Gook comes to the conclusion that the toothbrush must be for a DNA test. He even wonders if Dae-gu could be Pan-seok’s son, but quickly discount that since the age difference isn’t big enough. He even quips that he has seen too many dramas. Ha! Pan-seok trying to impress Sa-kyung. Despite having picked the restaurant, Pan-seok does not know anything about the food. He struggles to put together a summer roll, so Sa-kyung makes them for him. They also clear up the misunderstanding of the raining night. Yay! That was resolved a lot faster than I thought. The two continue their date with some light window shopping and teasing each other with pet names. It starts to rain later in the evening and the pair share a tender moment under the roof sealed with a kiss. The next day the team is out on a new case. They locate the suspect at a rooftop where Gook is hold hostage AGAIN. Gook accidentally spills the beans on Tae-il’s secret — the fact that he used to be a doctor. The suspect is captured because Gook beat him up in a fit of rage. Gook apologizes to Tae-il for letting out his secret, and Tae-il jokes that he should have told the team Gook has a crush on Soo-sun. They reconcile as Tae-il helps to bandage up Gook’s twisted ankle. Their bromance is absolutely blinding. Soo-sun’s oppa comes to visit her, and they enjoy some ice cream/cake at the cafe. Dae-gu passes by the store and Oppa immediately identifies him as Ji-yong. Soo-sun takes this opportunity to confirm her suspicions. Soo-sun and Dae-gu goes on a stakeout, but fails to capture the suspect. That, of course, was just a tool to get Soo-sun to run and fall because her shoelace came loose. She tries to try her shoes, but is stopped by Dae-gu. This act further confirms Soo-sun’s suspcion. She asks Dae-gu if he is Ji-yong, but he denies it and threatens to kiss her if she asks again (yeah, weak threat). Boots show up at the former chiefl of police, Assemblyman Yoo’s office to inform the latter that Ji-yong is not dead. Assemblyman Yoo is caught by surprise and it is apparent that he had a hand in the tragedy. Boots lets out that he knows where Ji-yong is and he will finish the job. Pan-seok gets the DNA results back and he is sure Dae-gu is Ji-yong. He looks at Dae-gu lovingly and begins to imaging young Ji-yong sitting there instead. He calls Dae-gu out to confront the truth. Dae-gu notices the DNA results and knows what’s to come. Pan-seok is completely absorbed by guilt for what happened, regret for not rescuing Ji-yong, and joy for finding out that the boy is indeed alive. He tries to initiate conversation with Dae-gu and get him to admit he is Ji-yong, but he will not have any of it. Dae-gu continues to deny his identity and lashes out at Pan-seok. As Dae-gu starts to walk away, Pan-seok states the DNA result cannot be denied. Soo-sun goes to Dae-gu’s apartment and pleads for ten minutes of time. She begins to asking him about Ji-yong and he continues to deny everything. Just when she is about to leave, he confesses that he is not Ji-yong but he knows Ji-yong. Dae-gu continues to talk in third person and explains that his “friend” Ji-yong can’t reveal his identity right now for a reason, and he asks Soo-sun to not inquire. So he basically confirmed everything to Soo-sun. D’awwwwwwww. The two take the conversation outside at a food stand. Soo-sun begins to talk about how happy she is to know Ji-yong is alive, and how she regretted fighting with him before. Dae-gu shares that he had a relatively fortunate upbringing at the orphanage, and being able to go to college due to the benefactor. Soo-sun chides that Ji-yong is two years younger, and he should call her noona, but because it is a special day she will let it pass. She also gets sentimental and tells Dae-gu that if Ji-yong should ever need help, he can always call on her. After they ate, they stand awkwardly saying goodbyes. Just as Dae-gu turns to leave, Soo-sun runs up to give him a BACK HUG! I have never seen a girl give a guy a back hug in this context. It has always been the other way around. The two stands there as Soo-sun laments on how happy she is to find Ji-yong alive, and how proud she is of him. Dae-gu starts to push her away but ends up holding her hands. The scene fades out with Dae-gu shedding some much needed man tears. Shed ’em man tears, Dae-gu!